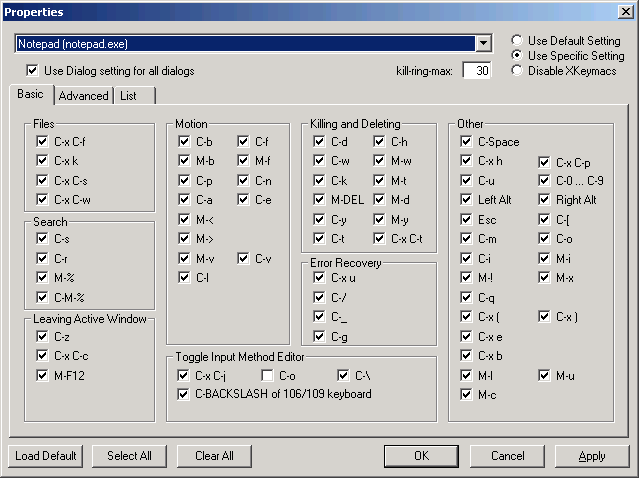 XKeymacs is a keyboard utility to realize emacs like-useability on all windows applications. With XKeymacs you can use emacs keybindings with any windows application. You can create a keyboard macro and assign any shortcut key too. You also get bash-like command completion in your DOS shell. If you do not know Emacs, Xemacs, Mule or Meadow, you probably want nothing to do with XKeymacs. I began to make XKeymacs because I wanted to add C-t and C-l to Keymacs. Now that all the functions I want are available, I think I will burnish XKeymacs by adding new functions that users want and to fix bugs. It includes xkeymacs.exe, xkeymacs.dll, Readme.txt, Readme_J.txt, dot.xkeymacs, FAQ.txt, FAQ_J.txt, release.txt, release_J.txt, spec.txt and spec_J.txt. It is the source code of xkeymacs.exe and xkeymacs.dll. You can compile them by using Microsoft Visual C++ 6.0. - You have to install Microsoft Platform Software Development Kit (SDK) and add include/lib directory at the top of list on Directory tab in Options dialog of Microsoft Visual C++ 6.0. It is installer of XKeymacs. It is the source of the installer. You can build them by Microsoft Visual Studio Installer. Please tell me your impression, question, request, etc. I announce bug information and new version release news on this ML. C-l does not work well with someapplications. C-r works as C-s with Internet Explorer if Find dialog does not appear. C-t, etc. do not work well with command prompt. C-k works as C-f on an edit box for a password. XKeymacs version 1.16 and later will be occured Invalid Page Fault error of Kernel32.dll on Windows 95. XKeymacs causes an application error when you shutdown Windows NT. XKeymacs conflicts with X-mouse of Tweak UI. The xkeymacs.exe require the mfc42.dll and the msvcrt.dll. If your system does not have these files, the xkeymacs.exe pop up an error message. When an error message is poped up, you must get the mfc42.dll (ex. from here) and the msvcrt.dll and put them in the directry which include the xkeymacs.exe.